1. 30 June 2010 (See Population changes). 2. Rank based on 2009 IMF data. Czech Republic (Czech: Česká republika, pronounced [ˈtʃɛskaː ˈrɛpuˌblɪka] ( listen)) is a country in Central Europe, sometimes also known as Czechia (Czech: Česko). The capital and the biggest city is Prague. The currency is the Czech Crown (koruna česká - CZK). 1€ is about 27 CZK. The president of the Czech Republic is Miloš Zeman. The Czech Republic's population is about 10.5 million. The local language is Czech language. The Czech language is a Slavic language. It is related to languages like Slovak and Polish. In 1993 the Czech Ministry of Foreign Affairs announced that the name Czechia be used for the country outside of formal official documents. This has not caught on in English usage. Czech Republic has no sea; its neighbour countries are Germany, Austria, Slovakia, and Poland. Its history dates from the 9th century AD, for a long time it was one of the most powerful countries in Central Europe. Later on it was the biggest, most populated and richest country of the First Reich, where many Emperors started their career. Under the conditions of the Treaty of Vienna 1515 parts of the Czech Republic, then in the Kingdoms of Bohemia and Hungary came under Habsburg rule after the death of Louis the Jagiellon in 1526. They stayed a part of the Habsburg dynasty rule until 1918. The area of the today's Czech Republic was a part of Czechoslovakia from 1918 to 1992. Czechoslovakia became independent in 1918 from Austro-Hungarian Empire. The first Czechoslovakian president was Tomáš Garrigue Masaryk. Czechoslovakia peacefully split into two countries (Czech Republic and Slovakia) in 1993. 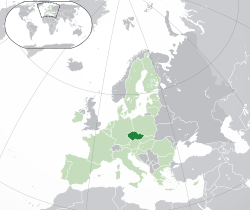 Czech Republic has been a member of the European Union since May 1, 2004 and a member of NATO since March 12, 1999. The highest point in the country is Sněžka at 1,602 m (5,256 ft). There are four national parks in the Czech Republic. The oldest is Krkonoše National Park. The others are Šumava National Park, Podyjí National Park, Bohemian Switzerland. In 1949 communist government created 13 centralized regions instead of historical countries. In 1960 was regions recreated and there were only 8 regions. In 2000 was created 14 regions with their own regional self-government. The Czech Republic has one of the least religious populations in the world. According to the 2011 census, 34.2% of the population stated they had no religion, 10.3% was Roman Catholic, 0.8% was Protestant (0.5% Czech Brethren and 0.4% Hussite), and 9.4% followed other forms of religion both denominational or not (of which 863 people answered they are Pagan). 45.2% of the population did not answer the question about religion. ↑ "Czech language". Czech Republic - Official website. Ministry of Foreign Affairs of the Czech Republic. http://www.czech.cz/en/67019-czech-language. Retrieved 14 November 2011. ↑ 5.0 5.1 5.2 5.3 "Czech Republic". International Monetary Fund. http://www.imf.org/external/pubs/ft/weo/2011/01/weodata/weorept.aspx?pr.x=51&pr.y=11&sy=2008&ey=2011&scsm=1&ssd=1&sort=country&ds=.&br=1&c=935&s=NGDPD%2CNGDPDPC%2CPPPGDP%2CPPPPC%2CLP&grp=0&a=. Retrieved 14 January 2012. ↑ "Human Development Report 2011". United Nations. 2011. http://hdrstats.undp.org/en/countries/profiles/CZE.html. Retrieved 5 November 2011. ↑ "Population by religious belief and by municipality size groups". Czech Statistical Office. http://www.czso.cz/sldb2011/eng/redakce.nsf/i/tab_7_1_population_by_religious_belief_and_by_municipality_size_groups/$File/PVCR071_ENG.pdf. Retrieved 2012-04-23. This page was last changed on 31 July 2014, at 10:41.